Fight Fairly You know that part at the end of Beauty and the Beast when the Beast has mercy on Gaston instead of killing him, only to have Gaston shiv him in the side a few seconds later? Growing up, I learned to fight Gaston style (with words. My childhood was sorely lacking in shivs), which is to say very dirty. You said what you needed to say to win the argument, and the person who can withstand the most metaphorical shivs to the side wins. Dan doesn't argue that way and I very quickly learned that fighting to win does not a healthy marriage make. I've learned how to argue in a way that leaves us both in one piece. Much less exciting, much more effective. Nobody wants to be a Gaston anyway. That dude is the worst. (Properly) Apologize. A good apology includes the following: "I'm sorry I hurt you. Please forgive me." That's it. No excuses, no hidden agenda to get the other person to apologize back, no pushing the blame on the other person (the infamous "I'm sorry you feel like I hurt you" apology). Just a straightforward, owning your crap and asking for forgiveness, apology. Easy peasy (hard to put into practice) lemon squeezy. Say what I mean (and how to be clear about my exceptions). Before the birth of my daughters I said "Absolutely no drugs, no matter what!" My husband believed me and sought to carry out my wishes to the best of his ability. This included avoiding my eye contact and pretending not to hear me when I changed my order from "no drugs" to "ALL THE DRUGS. NOW. RIGHT NOW." What I should have told him was "Absolutely no drugs, unless I say drugs and then completely disregard my first demand." Only had to make this mistake twice before I learned my lesson. Love without reservation. This is a direct result of first being loved without reservation by Dan. When we were dating he told me he was in our relationship for the long haul, and he has never once wavered from that stance. He has loved me openly and honestly through some ugly times and even uglier behavior, never once making me feel like I was in danger of losing his affection. The safety of that kind of love is like water dripping on a stone, steady and persistent until the rock cracks open. That kind of love cracked me open. Drive a stick shift car. I don't have any deep, introspective lessons here. This just makes me feel a lot cooler than I actually am, and I have my husband to thank for that. Really this should be titled, "An incomplete list of things I'm learning to do in marriage" because obviously I haven't mastered any of these yet (except for the epidural thing. Mastered that. Again, this is important to remember, Dan--I only don't want the epidural until I WANT THE EPIDURAL). Eight years is just a drop in the bucket, and I've no doubt that I'll look back in another eight years and think, "Oh you silly little girl. You didn't know a single thing." But I'm thrilled to stumble and trip my way forward along side my best pal and favorite team mate. Happy Anniversary, Dan-O! I love you and I like you. 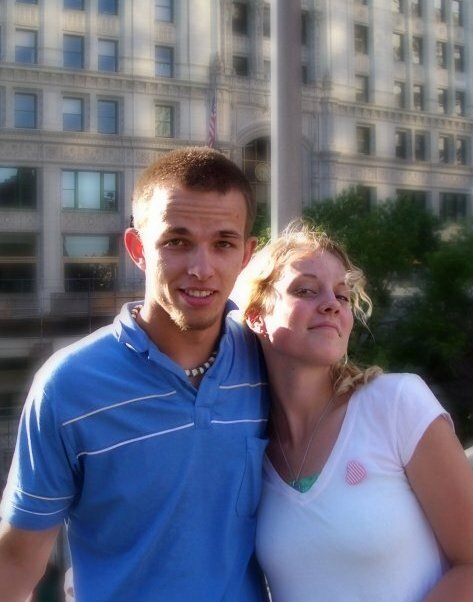 Dan and Em, pre-baby days. So young and carefree and unaware of how little sleep they can actually survive on. I discovered your blog today and I've been binge reading ever since. I really appreciate this one, I'm still learning to fight fair (among other things). Thank you for this.